Welcome to Putney & Wimbledon Brass Band! We’re a London based group offering a wide range of music. 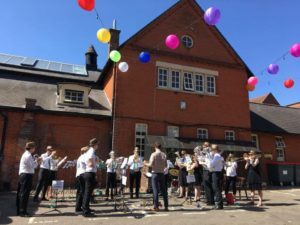 From traditional brass band and classical, to pop covers and TV themes, we play it all – and of course it wouldn’t be a brass band without the occasional march! Although only founded in 2017, the band has over 20 members and rehearses weekly, with regular social trips and gigs. We’re a friendly bunch and always open to new players coming along, so get in touch. Putney & Wimbledon Brass Band is available to hire for events big and small. Please contact us for more details.